It's awfully interesting that the Florida Panthers turfed coach Bob Boughner on Sunday morning, clearly setting the stage for Joel Quenneville to head to the Sunshine State. Jason Botterill dumped Phil Housley two hours later and Botterill has to know among the numerous sticky issues the Sabres have going forward, the Atlantic Division is becoming a big one. Think about it. The playoff format is locked in to a division format at least through next season, and perhaps longer. At minimum, at least part of it is going to stay long term. Gary Bettman loves instilling divisional rivalries and making the playoffs division-based instead of conference-based is a way to do that. What's happened now, however, is that the Atlantic has become super competitive. Botterill has to be having the same thoughts so many folks outside KeyBank Center are having: How are the Sabres ever going to ascend in this division, given the competition? Think about it. Three of the top seven teams in the overall standing are in the Atlantic (Tampa Bay, Boston and Toronto). So is Montreal, an improving team whose 96-point season was the best among teams that didn't make the playoffs. 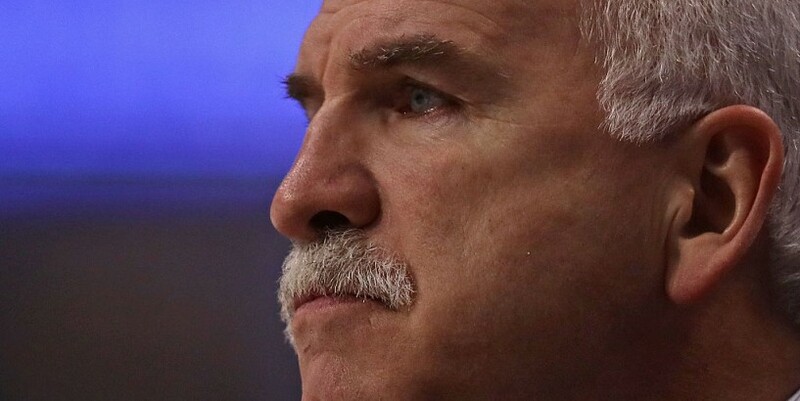 The Panthers underachieved at 86 points but Quenneville is surely worth a few points on top of that himself. So is a roster that might be augmented in free agency by Artemi Panarin – a Calder Trophy winner as a rookie in Chicago under Quenneville – and goalie Sergei Bobrovsky. It's long been rumored they might be a package deal on July 1 once Columbus' season runs its course. "That's the nature of the business. It's a competitive league and it's tough to make that jump from the situation that we're in to the playoffs," Sabres captain Jack Eichel said Monday on locker cleanout day. "Look how competitive the playoff race was this year. Montreal had a great year and they don't make it. Columbus basically sells the farm to get into the playoffs and they barely do it with the team that they had. "It's a competitive league. Every night, every point matters. There were spurts of good hockey and spurts of some really, really good things. There's some things to be happy about, but consistently it just wasn't there enough." Even Detroit, a team that the Sabres posted a 7-1 drubbing on Saturday night in the season finale, seems like it's coming on. The Red Wings were 8-2 in a 10-game stretch until that game. They just gave coach Jeff Blashill a two-year extension. They've got some terrific young players in both the NHL and at Grand Rapids of the AHL but don't have anyone to compare to Rasmus Dahlin. While the Sabres have to be massively disappointed to drop to No. 7 in the first round of the draft after the results of Tuesday night's lottery, they have to be equally as relieved that none of their divisional foes moved up. There was no Chicago-like miracle jump by Florida or Montreal, who remained at No. 13 and 15, respectively. And the real danger zone for the Sabres would have been a move up by Detroit to add Jack Hughes or Kaapo Kakko, but the Red Wings will be picking at No. 6. So the lottery didn't provide the Sabres any instant relief. You should be able to get a good player at No. 7 but that's not a position where your choice is likely to be in the NHL the next season. You wonder if the pick lands in a trade package for the Sabres to acquire some real help. Botterill loves development but he may not have the time on his hands to let the No. 7 pick grow. Keep in mind that Alexander Nylander was taken at No. 8 in 2016 and has still yet to establish himself as an NHL player. With the draft position finalized, Botterill can return to full attention to his coaching search. While it seems that he will talk to Todd McLellan this week at the Frozen Four, McLellan has a five-year offer from Los Angeles to ponder as well. Botterill needs to make a home run hire here before he's shown the door and he's in a tough spot. Again, check out the Atlantic's current roster of coaches: Jon Cooper in Tampa Bay, Mike Babcock in Toronto, Claude Julien in Montreal, a burgeoning bench star in Boston's Bruce Cassidy, and now you add Quenneville to the list. First-timers need not apply in Buffalo. Without major moves by the GM, it would seem the Sabres are dangerously close to being stuck in the Atlantic's nether regions with Ottawa. Senators GM Pierre Dorion insisted Tuesday "the worst is behind us" when he addressed the media at his end-of-season news conference. Of course, that's easy to say when you're coming off a 64-point season that was the team's worst in 23 years. The worst better be behind Botterill, too. Sabres forward Kyle Okposo believes in Botterill and doesn't subscribe to the theory the Sabres have a hopelessly uphill climb in the Atlantic. "That stuff changes from year to year," Okposo said Monday. "Going into the season, people probably weren't looking at our division and going, 'Oh, it's going to be a powerhouse thing.' You can never predict what's going to happen next season. "So I think our job is just to make sure the Buffalo Sabres are the best team that we can be next year. You can't really look at everything else. I know that the organization has endured a lot but I think we have really good people here and in place and I have a lot of faith in Jason." In his two years thus far, there's not a lot of reason to have faith in Botterill. This could be his final offseason to figure things out. The division he's in does him no favors.